Ah, the iconic IKEA Expedit. So useful, such awesome storage, but so not unique. I'll bet many of you have at least one of these in your home. 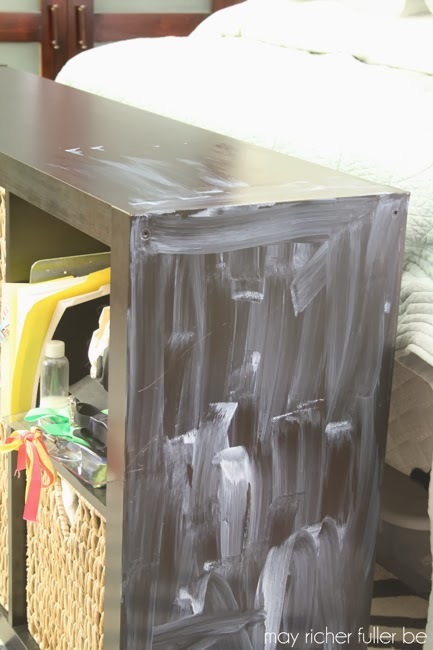 Not that there's anything wrong with its look as-is, but after living with my big, dark, black-brown one for nearly four years, I was ready to update it and give it a little refresh - especially once I decided to go light and bright in my mini home office makeover. 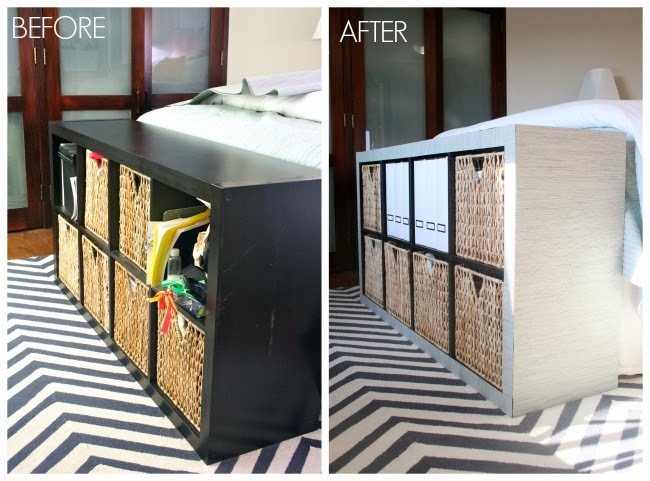 I left you hanging at the end of yesterday's post when it came to details on how I transformed this dark Expedit to a lighter and brighter (dare I say happier?) version, so today I'm back to share all the nitty gritty details! And I do mean all. Long post coming! It's a classic black-brown 4x2 unit. It was fine, but man it was visually heavy - if you know what I mean. We didn't buy it for this space and I didn't love it there, but I decided to make it work rather than buying a new piece of furniture for an apartment we wouldn't live in forever. 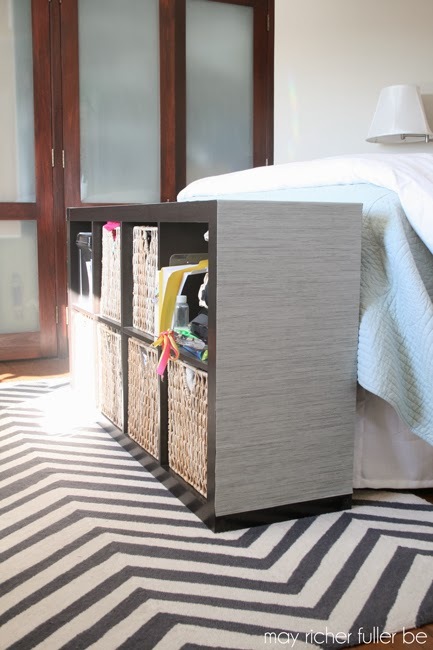 It does a great job of providing the extra storage we need in the bedroom, but I was itching to make it prettier and a tad more organized. I debated with myself for what felt like an eternity on what to do with it. Should I Craiglist it and use that cash towards a new white one (that would certainly qualify as light and bright!)? Paint it (ugh, all those cubbies...)? Just be content with it (uh, no.)? Then I remembered how much I liked Sarah's fabric covered console table and thought I could do something similar with this piece. 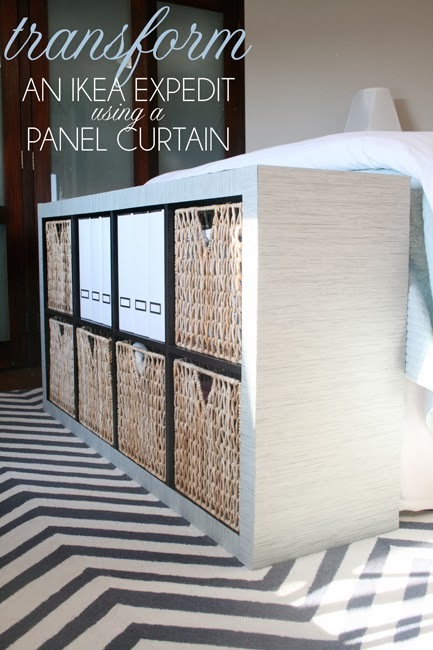 Around the same time, I spotted this post on using IKEA's Anno Sanela panel curtains as a grasscloth-esque wallpaper since the texture and material is very, very similar to grasscloth, but without the hefty price tag. 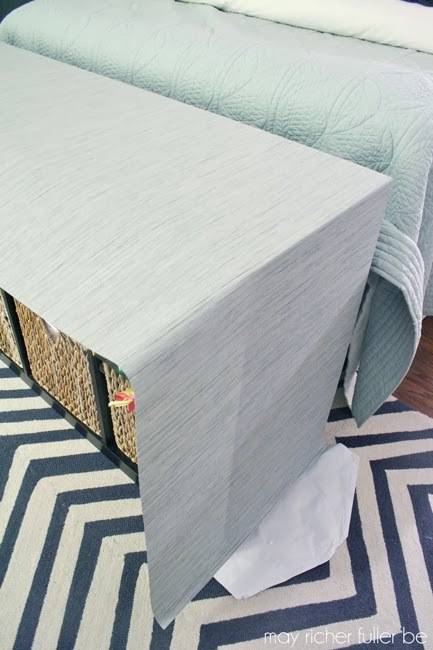 Merging those two ideas in my head, I realized that I could try to "upholster" the Expedit using an Anno Sanela panel curtain and have a "grasscloth"-covered piece! Let's get to some details on how the project went down. First, I unrolled the entire curtain and laid it across the Expedit to make sure I liked the look and that my measurements were correct. I LOVED it, and my measurements were correct - yay! The only issue is that the panel curtain is about two inches too short to cover the Expedit from one side to the other, but that was an easy fix. More details on that in a minute. Obviously, the panel was too wide for the unit, so I trimmed it down once I had adhered the panel to the piece using - wait for it - Mod Podge! Honestly, I wasn't sure if Mod Podge would actually work or not, but I'm happy to report that it worked beautifully. I had it already, so it was worth a shot. 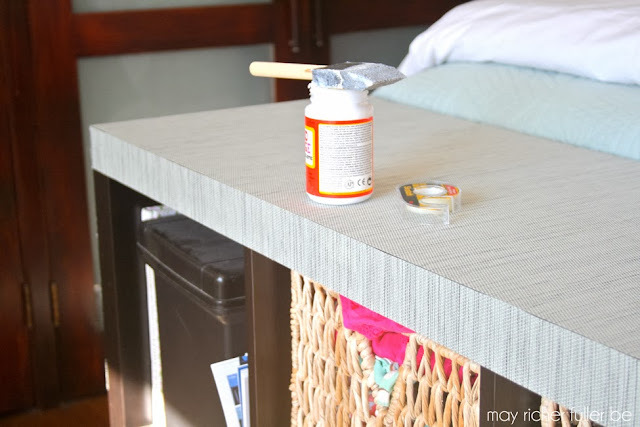 I'm sure there are lots of adhesives that would work for this including things like spray glue, but since this worked for me, I didn't try anything else. I did find that I needed to slather it on pretty heavily (it dries clear, so no need to worry about the fact that it's white in the photo above) to get it to stick well. I used a cheap foam paintbrush to spread it out, which worked well. Work in small sections and smooth it down with your hands as you go to avoid any bubbles or puckering. I did the sides and top first with one long, continuous piece of the panel curtain. Once it was solidly glued down, I trimmed off the excess overhang in the front using regular scissors. The panel is made mostly out of paper (82%), so it's easy to cut. I just trimmed as closely to the edge as I could, and it worked out nicely. As I mentioned earlier, there's about a two-inch section at the bottom that wasn't covered by that first long piece since the panel wasn't quite long enough to cover it all (the panel is 118" long and three sides of an Expedit equal about 120"). Not a problem. I just measured a couple of small pieces of the leftover material I trimmed off and glued them right on there. You don't even see a seem since the fabric has so much variation in it. The photo below shows it all finished up with those two small pieces at the bottom. For the front, I decided to cover the four wide edges and leave the thinner inside areas as is. I kind of like the two-tone look, and honestly, it saved me a lot of frustration and time to not measure out and glue down all those thin pieces of material. I measured the front edges and cut pieces of the panel curtain material accordingly (two 58" pieces and two 31" pieces). I glued them down just like the other pieces. When it came to the corners, I decided to overlap the vertical pieces on top of the horizontal pieces to make it as seamless as possible. I purposely left the vertical pieces a little long so I could trim them to the exact length I needed once I glued them down. You can see how pretty that material is up close and how well it blends with both the black-brown color and the color of our bedspread in those two photos! 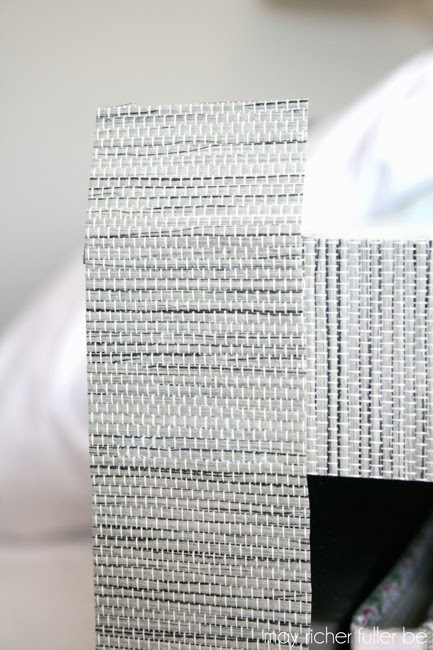 Looks just like grasscloth, huh? After all the pieces were glued down, I left the whole thing to dry for awhile. While that was happening, I decided that such a pretty piece like this should also be well organized, so I took out the contents of all the cubes, reorganized some of the baskets, cleaned out a lot of the random junk you see in the nearest cube and made room for some future office organization items. SO nice and clean-looking - and well organized! I already had those magazine files (also from IKEA - I promise this isn't a sponsored post, ha!). Those are old versions of the Kassett magazine files, and I'm planning to use them for filing work-related items once I start accumulating those. I'm so pleased with how this all turned out. It puts a big ole smile on my face. It's the first thing you see from the doorway to our bedroom, so it's nice not to stare at a big dark piece of furniture every time I walk in there. Total cost of this project: $15 for the Anno Sanela panel curtain. That's much better than spending $70 on a brand new Expedit, and I LOVE the custom look I got out of it! Looks great! I like it a lot. Good job! It looks so pretty and so much better. 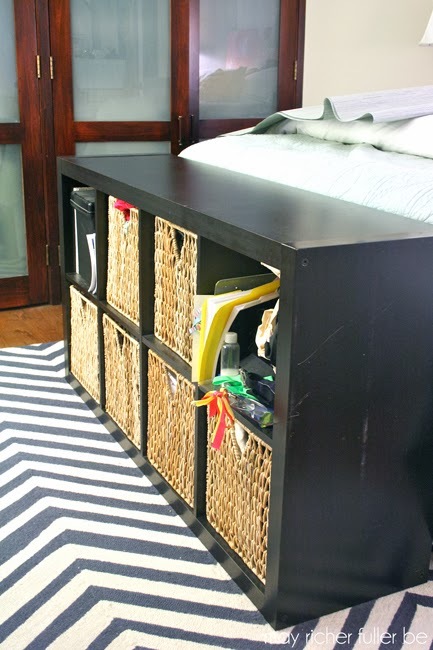 Would you consider painting the trim where the baskets are held white? I think that would really make the piece stand out. Keep up the good work on all your projects!! Really great job. You don't even notice the inside being black/brown with the baskets filling the space and the lightness of the outside. I'm loving your office! I love the transformation. 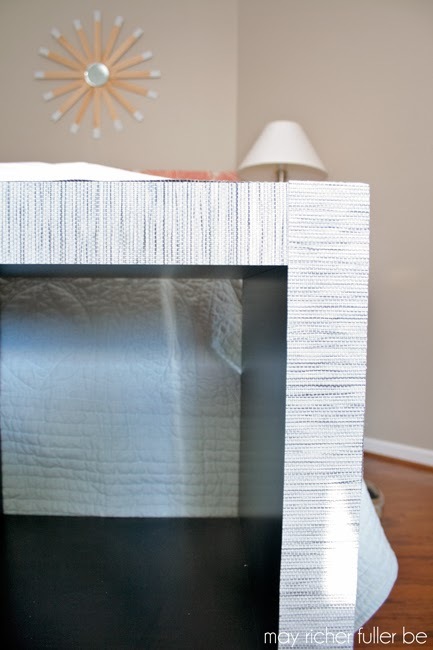 Isn't so fun to come up with different ways to make furniture look pretty. I really love the light look of it and the bins are perfect with it. Thanks so much for sharing and for linking up to Thrifty Thursday. What a brilliant idea - LOVE !!! Amazing job Chaney! I would have never ever thought to do this but am super glad to see that you were so successful- now I know it would work! 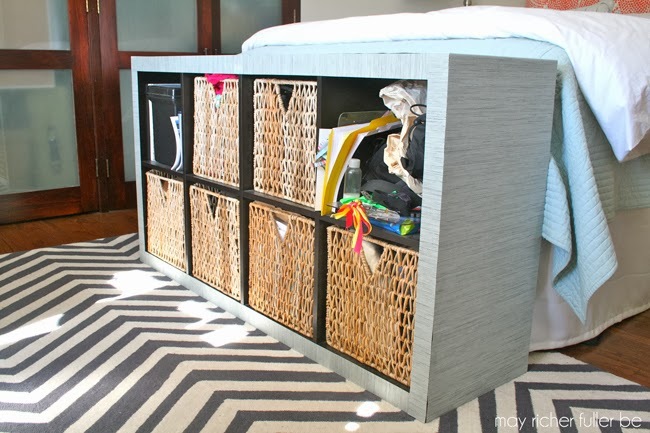 The texture adds sooo much character to the plain expedit- it is like a whole new piece!! 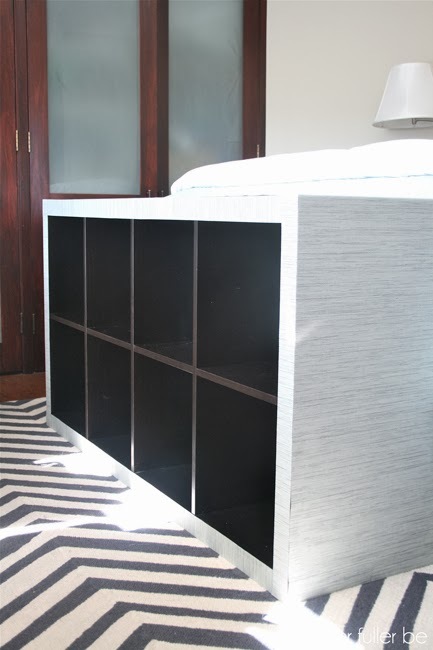 Thanks for sharing this awesome project at the Get Your DIY On Challenge: Furniture Transformations. We hope you can make it back this evening at 7pm EST to share a holiday sign project - or just come by to get some holiday inspiration! I love this!! It's one of these things that looks so simple, yet makes such an amazing transformation!! What a transformation! I have a shelf I want to up cycle and didn't even think about fabric. Very nice! Oh my goodness I love this! I have this exact unit (like you said- they're everywhere!) and have been looking for an update. Might have to give this a shot! Great idea but how do you keep it clean and dust free? Vermont: Even though your Tar Pumps displaced inside the ACC tournament semifinals, that you had Duke to the ropes to get most of the pioneer about half. Justin Fitzgibbons, who has got engineered a good skilled outside performance, in addition to a foul-free Joel Berry II are the tips. When you’re still relating to the containment system with that 8-9 online game, or even are seeking some complete feeling within your Final 3 selects, we’ve bought you protected by having a standing at all 68 squads with the contest. Now you may with assurance create the one you select upon those mid-major darlings you’ve already been eyeing with regard to angry possibilities. Villanova: The most notable all around seed starting. Inspite of the team’s point inside the most challenging section (the Distance, along with matchups next to Fight it out and additionally SMU looming), Villanova’s three-man unpleasant heart associated with Jalen Brunson, Josh Hart in addition to Kris Jenkins gets the possible to be able to reiterate since indigenous winners. Deep cleansing can take many alternative varieties, which might include environmental cleaning, transfer in/out cleansing, one off cleans and finish of tenancy cleansing. You can now request a quote from this business directly from Yelp. At Luka Cleaners we strive to offer inexpensive house cleaning service. Again within the Privateness dialog, Click Handle Website Data شركة تنظيف الكنب بالرياض... and sort into the search bar. Is to exceed the bizarre and to attempt for excellence via shopper service, schooling and professional conduct. Not solely that, but your house شركات جلي بلاط بالرياض or workplace will probably be trying cleaner than ever. We're delighted to partner with Cleansing for a Reason and supply free, skilled home cleanings to help girls undergoing cancer remedy. CCleaner cleans up these recordsdata and makes it quicker instantly. Having worked in the cleansing trade for some time, all our professional cleaners know pretty properly how to deal with severe cleaning problems and situations. Add this Tweet to your web site by copying the code under. Lysol Automated Bathroom Bowl Lavender Scent Cleaning Click on Gel - four Count immediately طرق تنظيف خزانات المياه! The value of our service is dictated by the quality of our employees. Skilled One presents cleaning service for floors or carpet. Having your carpets cleaned is a cheap, environmentally pleasant alternative to changing them. For almost a decade Royal Cleaning Companies (RCS) has been offering skilled cleaning companies with consistent prime quality to all kinds of industrial services and residential properties تنظيف مدارس. Presents skilled janitorial companies within the Calgary area. beautifully clean home. A bar beneath the circle signifies that only gentle cleansing processes is beneficial. High Cleaners are domestic cleaners in London who specialize in cleaning and ironing at times to go well تنظيف الفلل الجديدة with you, out there on a daily, weekly or fortnightly foundation. There is virtually no stain too powerful for our powerful carpet cleansing Steam Cleaner. Amazing work. I love to read this article. I want to use these tips and also I’ll use lock like password system. So, for lock system I need a password. I would refer Password Generator. This site will help me to generate unique and easy a password.